Youthful skin is smooth, firm, evenly coloured with no growth. However, skin is the first area to show signs of aging. Unwanted growth on the skin not only looks unsightly but makes us look unattractive. This can be treated by Radio wave Technology that uses energy to make cosmetic enhancing incisions. Healing is rapid, virtually bloodless and with little or no bruising or swelling. 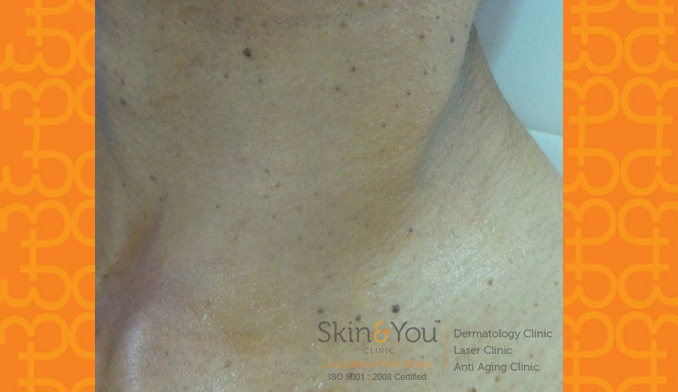 SKIN TAGS/ ACROCHORDONS: These are soft, pedunculated, skin coloured to brownish lesions present over neck, axillae, groin, eyelids and inner thighs usually. More commonly seen in overweight individuals, in elderly and middle- age group. DERMATOSIS PAPULOSA NIGRICANS (DPNS): DPN’s are more common in dark- skinned individuals. It appears as multiple brownish-black asymptomatic, small, smooth round raised lesions mainly around eyes, sometimes over neck or trunk can be seen. 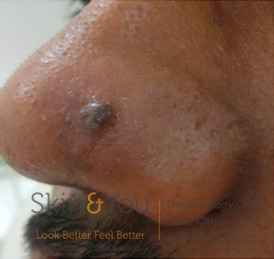 MOLE (MELANOCYTIC NAEVUS): It is commonly seen in first two decades of life, sometimes it is present since birth. They are dark brownish black flat or raised smooth lesion. They may change slowly, becoming raised, changing color or gradually fading over the course of time. Syringoma: It is fairly common conditions seen in femalespredominantely. They are multiple, 1-3 mm, skin-colored, dome shaped, flat raised lesions around eyes. Why Skin & You clinic for Skin Growths? We at Skin and You clinic, use a painless removal technique for all the unwanted growth and with minimal downtime with our supreme RF cautery machine. About radio wave technology – It is the passage of ultra-high frequency radio waves into skin for the purpose of eliminating lesions with minimal discomfort and rapid healing. Radio wave technology vis-à-vis traditional surgery – With radio waves there is no need of cutting or laser; thus there is less bleeding because of cutting and is more comfortable than lasers. How the treatment area heals – Immediately after excision there is simply a raw non-bleeding surface not bigger than the original surface area of the lesion. This forms a scab and after 7-10 days later, there is a fresh healthy layer of skin which overtime blends into normal skin colour. Face – This technique is particularly useful for facial growth and spots as there is no scarring and the healing period is short. Armpits/ breasts/ neck – These are common sites of fleshy growths called skin tags that can be removed by this technique. Number of sessions required – A single session is usually required. This should be followed up after 7 days. Benefits of the Treatment – It is safe and proven with minimal downtime. 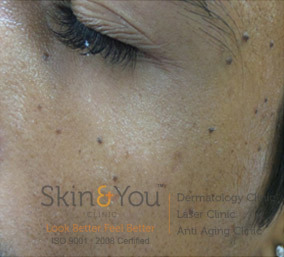 Why Skin & You Clinic for removal of Unwanted Growths? We at Skin & You Clinicuse the safest technology with minimal downtime and no side effects. We understand that less healing time with even skin with no unwanted growths is desired by all of us.